Refuge Lansing is a storytelling project celebrating decades of refugee resettlement in mid-Michigan. These are stories about families who have fled violence and persecution in their home countries and are now an integral part of the Lansing region - buying homes, starting businesses, sending their children to local schools, and adding to the diverse quilt that makes us such a unique, welcoming community. Yasser, 5, tells big brother Hussain, 18, a secret as sister Rokaia, 12, left, and other family and friends gather for a picnic at Hawk Island in Lansing. Nov. 4, 2008, marked the brink of stunning change for Faaza Dawd and Mohammed Kathem and the country that would now be their new home. “Everyone was excited about Obama’s election,” remembered Faaza, 36. Landing in Chicago amidst city-wide celebration, the couple and their children were fleeing the ongoing war in Iraq. Like the tens of thousands from all over the world who seek refuge every year in the U.S., Faaza and her family left home not knowing what to expect, yet eager to build a new life. Nearly nine years later, they have done just that. However, her family’s journey hasn’t been a straight road to stability, but one filled with challenges, and choices as well as rewards. Shortly after arriving in Lansing, Mohammed discovered his graphic design degree wasn’t recognized in the U.S., so he initially worked at Peckham. Then, when he learned of a medical transportation opening in Phoenix, the family made the move to Arizona. Eager to be an independent businessman, he purchased his own vehicles instead of working for someone else. But Arizona’s higher taxes took a toll and they returned to Lansing nine months later. Undeterred, Mohammed bought United Auto Sales, a used car business that he runs on Lansing’s south side. “The weather was better (in Arizona),” said Hussain, 18, the oldest son. Laughing, his younger sister, Rokaia, 12, said: “But the people here are nicer, they look you in the eye.” As families do, they’ve made adjustments — to find the right neighborhood to live in, to have their children excel at school and sports, to have time for picnics and summer trips, to make friends. Most importantly, they want to make a difference. Gathered in their Lansing townhome’s cozy living room, the older children chatted about sports and school. Mohammed, 49, turned down the TV, but, along with the boys, still gave occasional glances to the professional wrestling show airing. Mohammed Kathem; his wife, Faaza Dawd (not pictured); and their three oldest children fled Iraq and arrived in the U.S. on November 4, 2008. 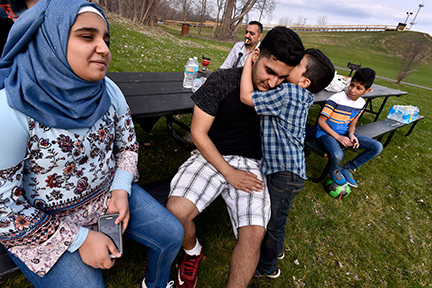 Mohammed, center behind, with, left to right: son Arshad, 16; family friend Emad Mohammed; daughter Rokaia, 12; son Yasser, 5; and son Hussain, 18, at a picnic at hawk island county park in Lansing in the spring of 2017. Faaza served sweetened coffee in delicate china cups. Arshad, 16, brought out the family pet, Simpson, a gray-and-white cockatoo that squawked and flew to the highest perch. 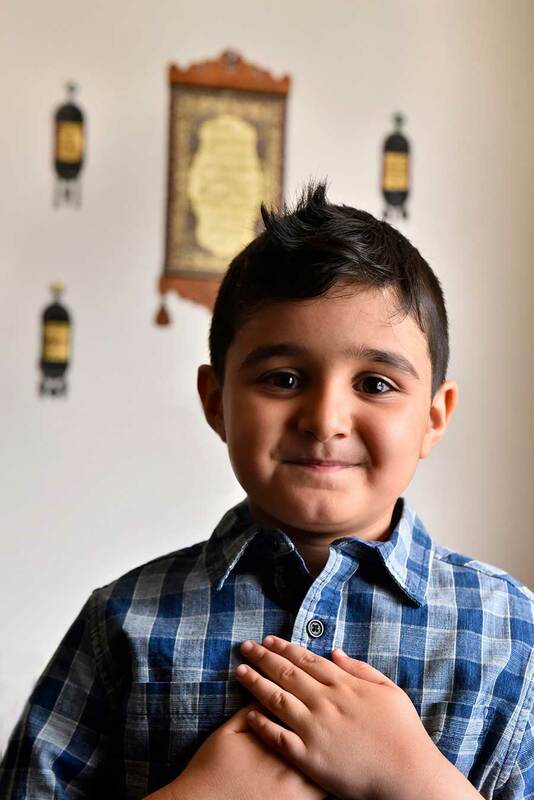 “He’s scared,” said Yasser, 5, the family’s youngest member and only one born in America. Moving to a new country was scary too, said Hussain and Arshad, recalling their pre-move impressions. “Everything we’d seen seemed to be about fighting,” said Hussain. But instead of the violent America they’d viewed on TV and in movies, Lansing was welcoming, which allowed the family to find their footing. The children have adapted quickly to American life. At Everett last year, Rokaia played on her seventh-grade basketball team. “We took fourth place, five wins and one loss,” she said proudly. Her brown eyes sparkled as she anticipated trying out for track, and excitedly described a three-day dance workshop led by a touring group that visited her school. She dreams of studying medicine with a focus on women’s health or oncology. “Both seem interesting,” she said. Like his sister, Arshad is interested in medicine, but with a focus on zoo animals rather than humans. A strong athlete, he swam varsity last year as an Everett High School freshman, competing in the 50- and 100-meter freestyle and backstroke events. “I’m not that good,” he said, despite an impressive first place finish in a 50-meter freestyle event. With a love for math and science, Hussain, a senior at Everett, wants to pursue engineering. Throughout high school, he participated in Michigan State University’s Gear Up on Saturdays, a program that prepares youth for college life, and he just won a coveted spot on the program’s annual Ivy League tour. Hussain had hoped to attend MSU, but because he lived away from Lansing for a time during high school, he was ineligible for scholarships that would’ve made the school affordable. While it was disappointing, especially after he received his acceptance letter, Hussain remains practical. “I didn’t apply to any other colleges in order to remain close to home,” he explained. Hussain, who helps his dad at United Auto Sales every day after school and on weekends, plans to take general education classes at Lansing Community College, then transfer to MSU to complete his bachelor’s degree. 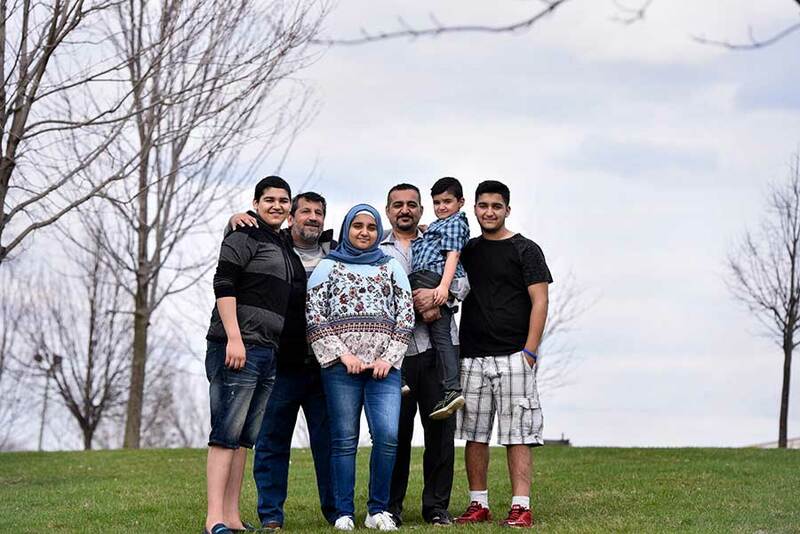 In fact, Hussain could end up carpooling with his mom; Faaza already attends LCC, studying English in preparation for the nursing assistant program in the fall. She’s pursuing nursing because she “likes to help people,” but she also has dreams and ideas for her own business. Faaza is generous with her time and committed to the Lansing community. She’s a translator for the Lansing School District through the Refugee Development Center. She teaches Arabic to children at the Islamic Center, offering rides to children who need them. She also leads a sewing circle that’s as much about advising and assisting the women as it is about stitching. Resettled in Lansing, Faaza and her family have created a new world for themselves, abundant with work and school, faith and friends. Tou Vue was a tiny infant when his parents fled Laos as communist forces enacted revenge on the Hmong for supporting American troops. Now he’s a network engineer for the Lansing School District and has three children of his own. Late on the night of June 2, 1979, a Hmong family slipped out the door and into the forest, heading south towards the Mekong River. The young father led the way, followed by his wife, carrying a tiny baby boy, only one month and 10 days old. Three boys and a girl hurried beside them. They could travel only at night so as not to be seen by the soldiers hunting the Hmong. Now, 38 years later, that infant being carried to safety in his mother’s arms sits in his office at the Lansing School District and recounts that desperate night. In May of 1975, communist forces overran the headquarters of the CIA-supported army of Hmong General Vang Pao, who had been fighting in support of American troops for almost 15 years against the North Vietnamese and the Pathet Lao. The CIA helped Vang Pao and other Hmong leaders escape to the US. Then, the Laotian Army began to seek revenge. In the years following, tens of thousands of Hmong fled Laos on foot, crossing the Mekong River into Thailand, heading to the Ban Vinai Refugee Camp, ten miles south of the border. Life in the new country was not easy. Tou holds an old photograph of his family, each member checked off and accounted for as they prepared to leave a Thai refugee camp for resettlement in Michigan. “There was a language barrier, a food barrier, cultural changes,” Tou says. From there, the family gradually began to adapt to the new environment and make progress in their new home. For Tou, school provided the path forward. “It was a challenge going to school,” Tou says. 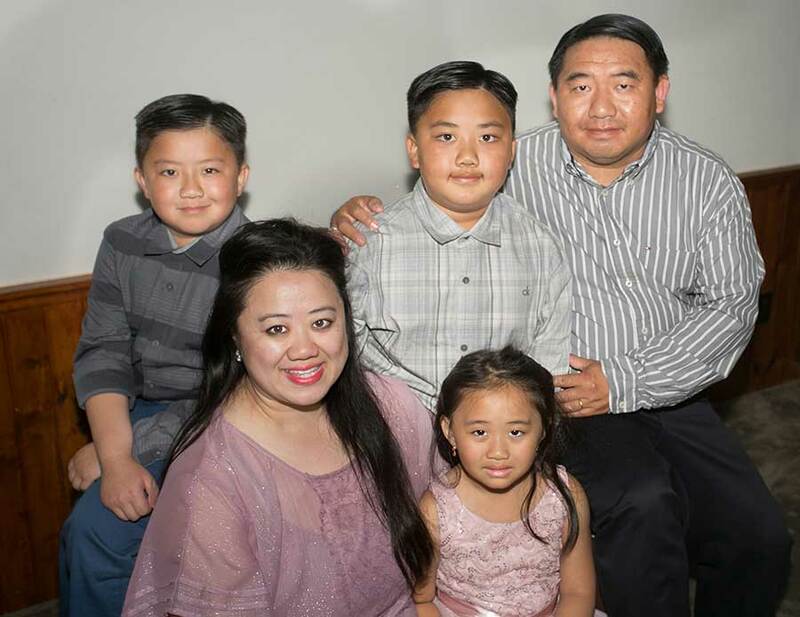 Tou with his wife Shaua and their children, from left: Grant, 9; Gavin, 8; and Gracelyn, 5. After graduating from Eastern, Tou attended Lansing Community College and earned an associate’s degree in computer information systems before transferring to Davenport University, where he completed his bachelor of science degree in IT and network engineering. Thanks to great mentoring, he had already begun his transition into the work force. 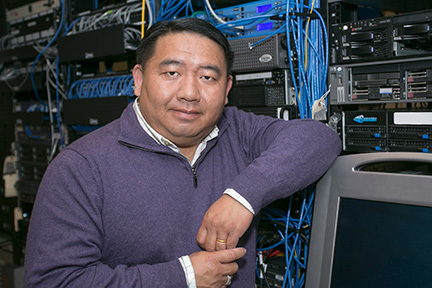 “During college, I started working for the Lansing School District at Eastern High School as a building media support technician,” Tou explains. “I worked there about two or three years, and then I transferred to the LSD Technology Department. The schooling and mentorship he received through the Lansing schools were key to his success. 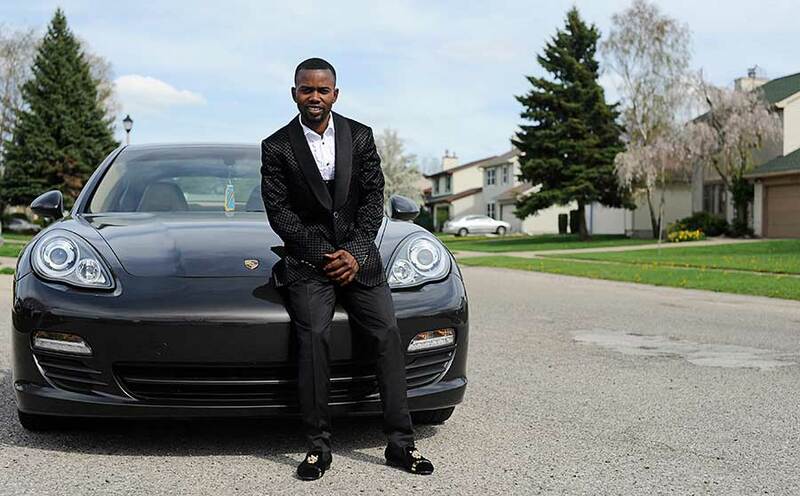 Originally from the Democratic Republic of the Congo, Otis Ebulela and his family spent three years in a Tanzanian refugee camp before being resettled in Lansing in 2010. Otis Ebulela left the tumultuous Democratic Republic of the Congo with his mother, father, ten siblings and two cousins in 2007. They made their way to a refugee camp in Tanzania where they spent three years — getting separated from one of his brothers along the way. In 2010, they were officially able to resettle the rest of the family in the United States. They spent their first few days in New York City, where Otis recalls being anxious of what was to come. He was surprised to see people outside with their shirts off in the late spring air, too frigid for his West African blood. “In the Congo, when a man walks around with no shirt on, you think there is something wrong with them or they might be trouble,” Otis said. “America was not the paradise I thought it was in my mind in the Congo,” he said. Otis loves cars, especially his charcoal Porsche Panamera. It’s a symbol of the success his family has earned here. Things in Michigan were different. Though quieter and colder, Lansing was just what Otis needed to thrive. When he first moved here, he knew very little English, limiting his educational and work prospects, so he spent a lot of time at the Refugee Development Center. Otis’ English today is nearly flawless, even if he won’t agree. Many newcomer refugees move from where they are originally resettled, but the Ebulelas stayed in Lansing. Otis believes that Lansing is different because of the warmth of the community. After some time on Lansing’s Eastside, Otis and his family now live in Delta Township in a two-story, baby blue home with white trim and a deep front porch. He bought it for his parents, working tirelessly as a warehouse associate at Meijer. He started working there the year he moved to Lansing — after a short stint at Baryames Cleaners — and has been there ever since. As one of the oldest sons, he has taken it upon himself to provide for his family. 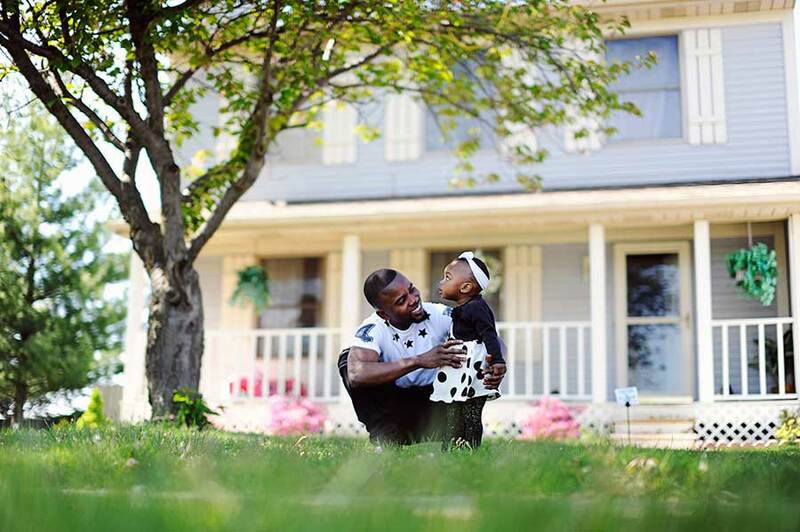 Otis plays with his 17-month-old niece, Rebecca, in front of his Delta Township home. “I just feel like I’m peaceful here,” he said. 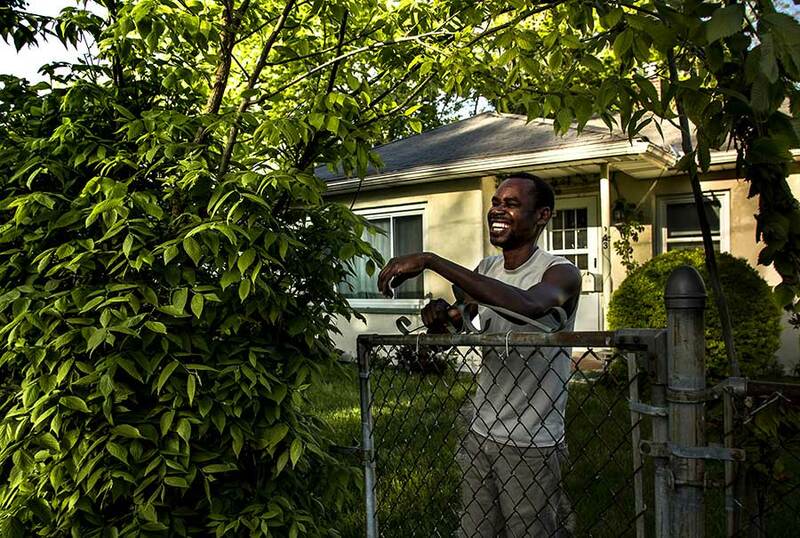 “I work so hard to make sure that everything my family needs, they have it,” said Otis. When the Ebulelas moved to Delta Township, they were greeted with gifts and cards from many in the neighborhood. His sister and her family bought a house in the same neighborhood after she started a family. The driveway of their home is lined with cars, not only because the Ebulelas are a large family, but also because Otis — in tune with the automotive roots of his new home — loves cars. His first car was a modest 2004 Toyota Corolla. After that it was a 2008 Dodge Charger in red. Otis souped it up, complete with rims and tinted windows. After being pulled over one too many times, a cop jested with him about his car being the kind they tend to stop. So, he bought a yellow Camaro. After a few others, he landed on his current beauty: a charcoal Porsche Panamera. What’s different about his sports car affinity, one might ask? Otis has purchased four-seaters, so his family can enjoy the ride along with him. Even if he won’t let them drive. Otis is sometimes nostalgic for the people he knew and the way things were back in the day in the D.R.C. Otis turns 30 in June. He plans to head to Toronto to visit his brother — the one who was separated from the family on their way to Tanzania. They weren’t sure if he was alive at first, but after being in Lansing for sometime, they got wind of the wonderful news that he was safe and had been resettled in Canada. They were reunited after 10 years apart. Durga, left, and Dixya Acharya spent 17 years in a Nepalese refugee camp after fleeing persecution in Bhutan. 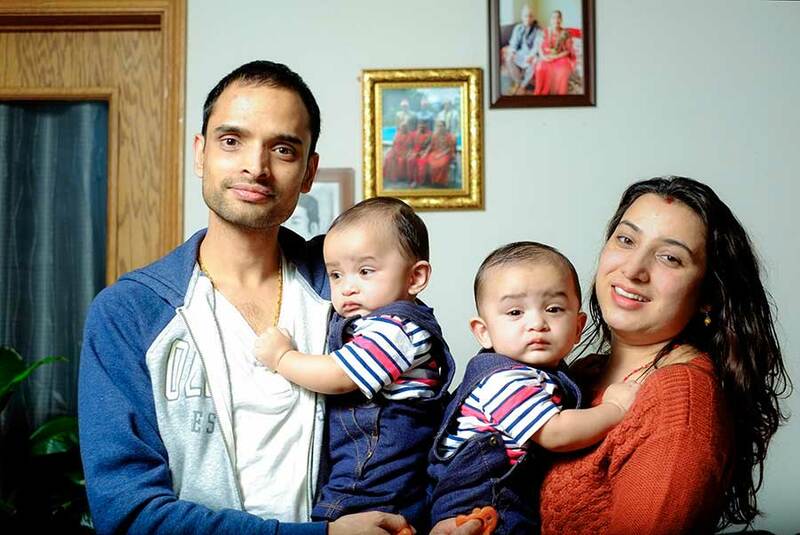 Now U.S. citizens, they recently celebrated the birth of their twins, Shrish and Shrivas. 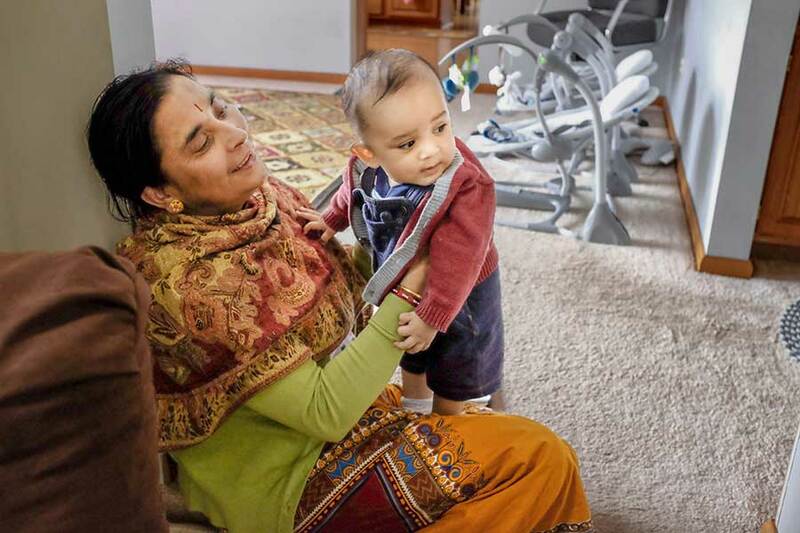 For Durga and Dixya Acharya, there was no straight line to building the American dream or finding their way to Lansing. Both were born in Bhutan, a small country tucked into the Himalayas, in the 80s, at a time when the country was undergoing ethnic cleansing as part of the “one nation, one people” effort. The brutality stripped people like the Acharyas of their citizenship and basic human rights. Both of the couple’s families were forced to leave Bhutan for Nepal’s refugee camps. He was 8 when his parents fled with him and his three siblings; Dixya was 4. “We had to leave everything behind,” says Dixya, now 28. “There was no transportation, so we walked to the Indian border,” Durga adds. It took them several days to make the trip of more than 100 miles to get to the refugee camps. Although the families had escaped the imminent dangers in Bhutan, they lived in abject poverty for the 17 years they spent in the refugee camp in Nepal. “People died because of the hot climate and poor sanitation,” Dixya says. Dixya worked as an interpreter for other Bhutanese refugees before choosing to stayhome and care for their 1-year-old twins. “Our families did fight to go back, but there was no hope,” Durga says. Durga’s family came to the United States in 2008 and Dixya’s family arrived in 2009. 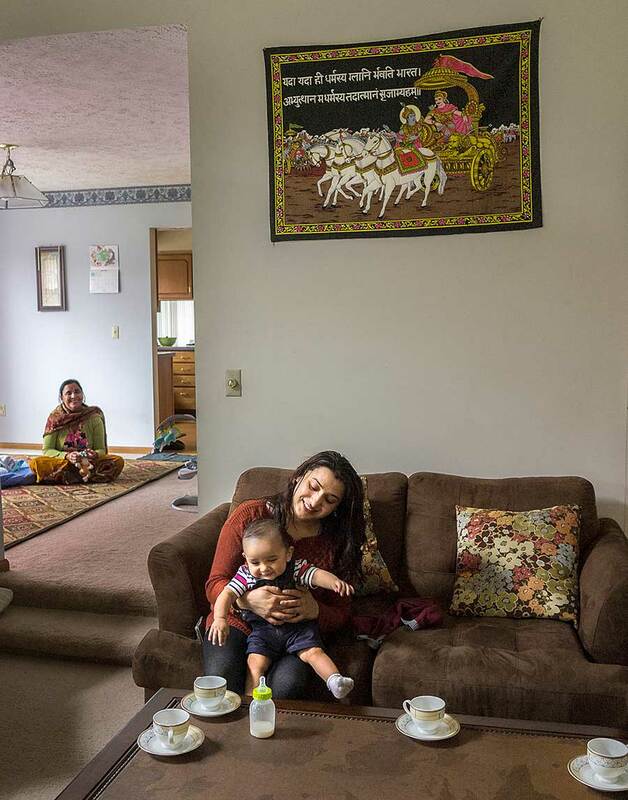 Now, they are among about 300 Bhutanese refugees who live in the Lansing area. “I never dreamed of coming to America,” Durga says. Durga became a student at Michigan State University in 2009. After graduating, he became a pharmacy tech worker in a lab. He went on to medical school and is currently in a residency program in Pontiac, coming home on the weekends. Being away from his family and his and Dixya’s 1-year-old twins is hard, but both he and Dixya are clear that they are working to bring security to their family. Dixya has worked as an interpreter for other refugees as they get established in our community. She also worked at the Refugee Development Center (RDC). Since having the twins, she became a full-time, stay-at-home mother. She says the center and other resettlement agencies are essential in helping refugees make the difficult transition to life in this country and in the communities where they resettle. Durga’s mother, Januka, helps with the twins in the evenings. Like many who have resettled in the Lansing area, the Acharyas have built a life that includes extended family. They worked hard to create an intergenerational home that includes Durga’s mother, Januka Acharya, 52, who works full-time at Peckham Industries, and helps with the babies in the evenings. Durga’s father, who was a businessman in Bhutan, suffers from PTSD and extreme depression, because of what he endured. Their Lansing house is also home base for Durga’s sister, who is a student, and his younger brother, who is in the U.S. Army. Durga and Dixya became naturalized United States citizens in the past few years. She says her father, who lives on the East Coast, is also a naturalized citizen now. The Acharyas agree that there are a lot of misconceptions about refugees. “Our parents came here for a better life for their children,” Durga says with pride. 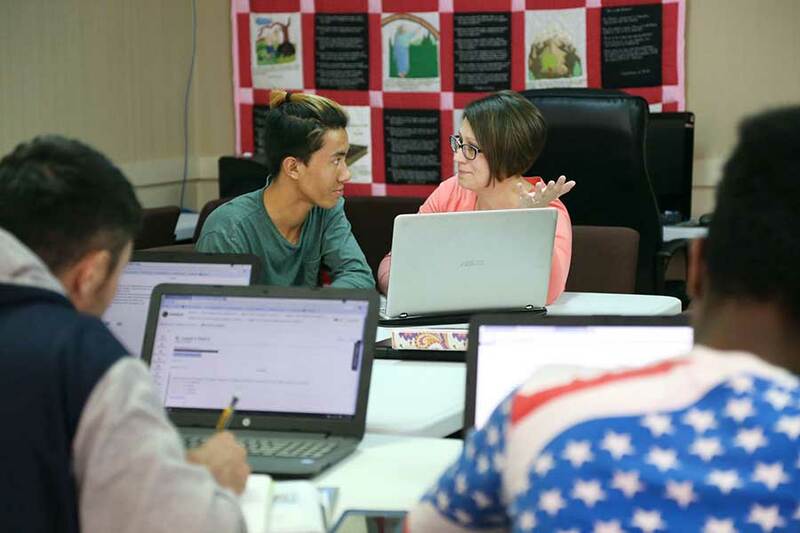 They both say their families prioritized education for their children, making sacrifices so they could learn English and acquire the skills they needed to build a solid life here. That same holds true for Durga and Dixya. When they were looking for a home here, their priority was finding a good school district. Dixya knows that many people don’t understand their refugee story and the dangers that drove them to flee. They would like people to understand their drive and hard work. Moe Naing Israel and his wife Mi Thanda own the popular Naing Myanmar Family Restaurant on Lansing’s south side. Their menu features recipes from Myanmar, their homeland, as well as from Thailand, where Mi went to work as a young teenager, and from Malaysia, where Moe fled to after a military coup in Myanmar. Their sons are Samuel, 12, and Jason, 3. 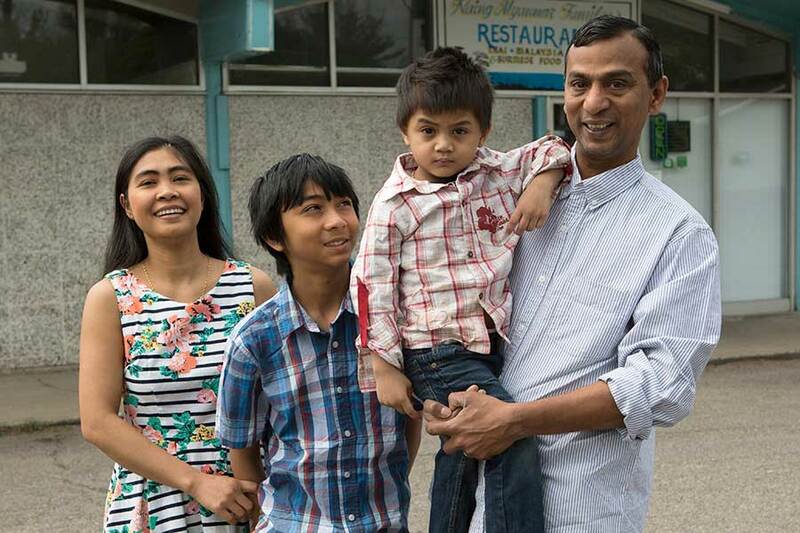 On many nights, Moe Israel will lift his youngest son into his arms and wait tables at Naing Myanmar Family Restaurant with the boy’s head on his shoulder. Jason is 3. He has a space between two coolers that’s his. A papasan chair in Spartan green. An iPad with the LEGO Batman Movie game. But sometimes he wants his father. And Moe wants to be with his kids. The restaurant was his wife’s dream. When she was 12, Mi Thanda left her home in Karen State, where the country no longer known as Burma bends toward the Malay Peninsula. Too many soldiers, her mother said. She went to live with an aunt in Thailand and was working in a Bangkok restaurant by age 14. Deliveries ran through a forest of elevators, up and down the city’s high rises. The hours were long on weekdays, shorter on Saturdays. Sundays were for church because the restaurant’s owner was a Christian. Naing Myanmar shares a weathered strip mall off Cedar Street on Lansing’s south side with a medical marijuana dispensary. The wallpaper is painted with Thai dancers and a peacock and the Karaweik, a replica of a floating Burmese palace built in the 1970s on the edge of Royal Kandawgyi Lake. It refers, in part, to the fact that their water was shut off in 2015 because their landlord stopped paying the bill. Loyal customers donated nearly $10,000 to help them move, though the water was back on before they had to. 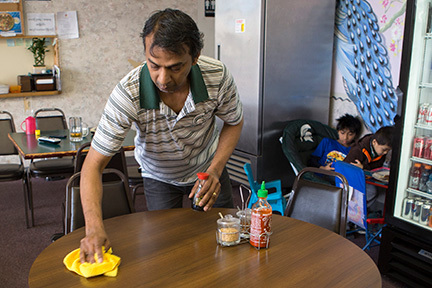 Moe clears tables after the Saturday lunch rush at Naing Myanmar Family Restaurant. He worked in a car factory in Malaysia for 13 years before opening a restaurant there with Mi. But as a refugee, his legal status was precarious. The family was resettled to the United States in 2010. Two copies of that tribute hang on opposite walls. There is also a framed certificate from TripAdvisor congratulating them on their first five-bubble review, left in April 2014. “This might be the best Asian restaurant in the Mid-Michigan area,” it begins, misspelling intact. “My mom and my boss in Thailand, they give me recipes over there,” Mi said. They serve the beef curry her mom made when she was a girl. House tempuras. A bean and pickled tea leaf salad with a tang strange to the Midwestern palate, though they order the leaves from Fort Wayne. There’s the pad see yew and tom yum soup she cooked in Bangkok. On weekend nights, she makes mohinga, a fish soup that’s one of the national dishes of Burma, and a Malaysian flatbread called roti canai. Malaysia is where they met. Moe had marched in protest through the streets of Rangoon with thousands of other students in August 1988. The demonstrations against one-party rule spread across the country but ended with a bloody military coup. Burma became Myanmar. “Army, military, they wanted to cash me out. So we run,” he said. He walked and rode buses, first to Thailand, then Malaysia. For 13 years, Moe worked in a car factory. He and Mi met in a church in Kuala Lumpur. They married in 2004 — she was barely 20, he in his mid-30s — and opened a restaurant. Their older son, Samuel, was born the following year. When Samuel was 5, they left. Moe was in Malaysia as a refugee, his legal status precarious. The United Nations gave them a chance to go elsewhere. Which is how Moe came to work at a Starbucks in Boston’s Logan Airport. He remembers it as a “very hard time.” They took English classes in the morning. He worked until after the last flights departed, arriving home hours after his son was asleep. Mi, Moe and Jason shop weekly at Horrocks Farm Market for the restaurant’s food supplies. If they opened another restaurant, she would remind him, the family could be together. Lansing had Burmese immigrants. It was cheaper than Boston. They went. On a Thursday afternoon, as the last table from the lunch rush rose to leave, Jason wandered into the dining room. “I want watermelon,” he announced. “Two pieces?” his father asked. Behind the window that connects the restaurant’s dining room to the kitchen, Mi pulled a soccer-ball sized melon from a cooler. Their days in the restaurant are long, from nine in the morning often until 10 at night. On Sundays, they fill shopping carts at Horrocks Farm Market with peppers, cabbage and cucumbers for the coming week. It’s easier than it was in the years when Moe worked night shifts at an auto supplier and then at the Meijer warehouse while Mi ran the restaurant. Easier than the fretful first months, when they realized the Burmese community alone couldn’t support them. A story in the Lansing City Pulse in April 2014 turned the tide, they say. The day after it came out, there was a small crowd. Mi wasn’t ready. She called neighbors to help wait tables. Moe talks proudly about Samuel starting seventh-grade at Lansing Christian School this fall. They’ve paid the tuition, thousands of dollars. They’ll return to Myanmar for the first time in decades this summer, take the boys to meet their grandparents. The restaurant will close for weeks. “We work hard, spend for family,” Moe said. “When I come back, we can start again. Diego Ixcotoyac-Us, a 19-year-old Guatemalan refugee, speaks to his brother on the phone while working at his side job remodeling a rental property in the Lansing area. He graduated from Sexton High school and looks forward to applying for citizenship in 2019. Most 14-year old boys get lost in video games, sports or homework. At 14, Diego Ixcotoyac-Us made the solo desert trek to the United States. Diego was born in Guatemala in 1997. When he was 4, his 11-member family moved from a small village to a bigger city. His parents opened a convenience store, which temporarily provided for the family. “It went out of business after we could not get more supplies,” Diego recalls. The family turned to planting vegetables. A productive onion crop allowed them to build a house of their own for the first time. Life shifted again when the Guatemalan economy took a downturn. Diego’s father, brother and sister left home every morning to look for temporary work. Food was hard to come by. At 12, Diego started farming on his own so he could help support his family. Another, more dangerous threat loomed over Diego, though. Years of extreme violence and rampant gang activity in Guatemala threatened Diego’s very life. He decided to try to go to the United States. His mother cried and said no. Diego helps tidy up the kitchen at the house he shares with one of his brothers and six other boys in foster care. Without telling his parents, Diego planned his trip. He made a deal with a “coyote” (a smuggler) for 35,000 quetzals, the equivalent of $4,000. His parents risked everything to send him to a safer place. In the early morning of May 12, 2012, Diego left his home with only a backpack containing a jacket, a pair of jeans, a T-shirt, a pair of socks and two pairs of underwear. His family had celebrated Mother’s Day just two days before. He would not see them again for four years. Diego’s journey consisted of long car rides, longer bus rides, sleepless nights in the open desert and hours of walking. Danger and uncertainty punctuated his every step. Despite being robbed by Mexican police, conned by a second coyote and enduring a shortage of food, Diego remained determined. After weeks of travel through Guatemala and Mexico, Diego reached the Arizona border. A U.S. Border Patrol helicopter dashed his excitement as it landed in his path. Border Patrol took him to Southwest Key in Tucson, a national nonprofit organization committed to keeping kids out of institutions. He was granted refugee status. “When I came to the facility, I looked at the U.S. map,” Diego said. “It was the first time I’d seen it and I finally understood how big it was. After five months of attending school, going before judges and learning English, he matched with a foster family in Michigan. Diego moved to Lansing in December 2012 through the help of Samaritas, an agency that helps refugees, including unaccompanied minors, settle in America. “I never thought I could get my legal status,” he said. “It was awesome. Diego works full-time alongside his foster dad, Ray, as property manager at Summer Place Townhomes in Lansing. And life in Lansing has been anything but boring the last five years. In 2016, he graduated from Sexton High School, a math, science and engineering academy. Physics was his favorite class. Graduation without his family by his side was bittersweet. He mastered English after devising his own memorization system. Now, at 19, he works full-time as property manager at Summer Place Townhomes, a housing complex serving refugees. He works construction on the side and hopes to start flipping houses to provide safe, affordable housing for people like him. He’d like to farm. He loves to work and work hard. Diego earned his permanent residency and will apply for citizenship when he is eligible in 2019 — and then hopes to help his sisters get a U.S. visa. “I don’t want them to go through what I did,” he said. Meanwhile, he sends money to his family in Guatemala to help them survive. A brief visit reconnected them in 2016. He knows that some people don’t understand refugees’ challenges and contributions. It doesn’t bother him too much. He is too busy working hard and moving forward. “I want people to know what we’ve gone through and what we want to accomplish,” he said. After working with the American military during the Iraq War, Murtadha Abdul fled Basra in 2008 and became a refugee in Turkey. Resettled in 2010, he works as a manufacturing supervisor at automotive supplier, Williamston Products, Inc.
Dreamland. That’s what Murtadha Abdul called America as he grew up in the city of Basra in southern Iraq. Back then, America seemed as fantastic and full of potential as it was impossible to reach. 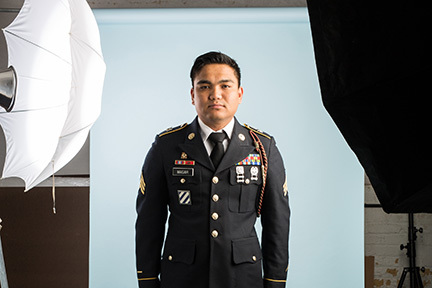 Friends and family called him a dreamer, but Murtadha believed — in himself, and in America. These days, most people know Murtadha as Mark, and his life is as American as it gets. Now 35, he’s a manufacturing supervisor at automotive supplier Williamston Products Inc. and lives with his wife, Stephanie; their 3-year-old daughter, Layla; and his 12-year-old stepdaughter, Olivia. He’s worked with local courts and police departments as an Arabic translator. His current dream is to bring his parents and siblings to America, so they can share in the American dream. It’s a story Mark says could only happen in America, a place where he arrived as a refugee in 2010. America took him in because Basra became too unsafe. Mark graduated from a university with a degree in business administration and specialized in warehousing and logistics. He worked for the U.S. military and American contractors during and after the war. When the war ended, the violence did not. When he left his home and family in 2008, Mark didn’t know where he would end up. He became a refugee in Turkey and worked as a logistics liaison between the Turkish and Iraqi governments. Two years later, he got the news he was waiting for: he’d been assigned to a permanent home. He was coming home to America. St. Vincent Catholic Charities helped Mark settle into an apartment and found him a twice-a-week cleaning job at the Delta Township General Motors plant. For some, it would have been a big come-down after being an inter-government liaison. Not for Mark. One incident made it clear to Mark that America was the sanctuary he had yearned for. Months after arriving, Mark relied on his bicycle to commute between Lansing and his Delta Township job. One night, a police cruiser pulled up beside him, lights flashing, and asked him where he was going. One snowy night, desperate to get home, Mark pulled out the card and called for help. The police officer came to get him — in his own, personal car and on his night off. But before that could happen, Mark had to prepare for them. He took a manufacturing job at Williamston Products that offered more hours. His boss saw his hard work ethic, and he was promoted to team leader and then truck driver and materials handler. Eventually, he was asked to become a manufacturing supervisor. Even as Mark established his life here, he never forgot the people at St. Vincent who helped him find his way in America. He worked for the charity and wanted to learn more about the Catholic faith that drives its values. “In 2011, I went to St. John’s Catholic Church in East Lansing,” Mark said. “I started exploring. I was shocked by the music — it was unlike anything I’d heard in Iraq. Catholicism connected to him in a way the Muslim faith never did, he said. With trepidation, he called Iraq to tell his mother. She just wanted him to be happy. 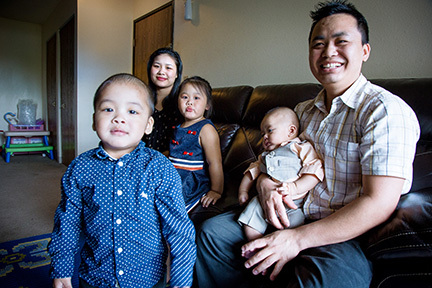 Mark was baptized — “I found faith and opened my arms to Him,” as he puts it. Finding his wife, Stephanie, also brought him joy. They married in 2012, and her family welcomed him into theirs. It is why he was taken aback when the federal government announced the refugee ban in early 2017, threatening to quash his plans to bring his family over. He’s confident he will. Mark believes America will do the right thing. America always does, he said. Binod Magar was just 10 months old when his parents left Bhutan for a refugee camp in Nepal. Binod Magar tells people he’s from Michigan. But Nepal didn’t let refugees claim citizenship, and the Bhutanese government never accepted his family as Bhutanese. Binod was 10 months old when his parents moved him and his six older brothers and sisters from their home in Bhutan into one of Nepal’s seven refugee camps. He was 5 or 6 when he understood he was without a country. The realization came at a soccer match between Bhutan and Nepal. Binod recently finished his first semester at Michigan State University, studying business in order to help his family’s store. Some of his older siblings left the camp first, settling in Lansing. Binod, his parents and an aunt followed about a year later, arriving in Lansing in 2010 when he was 18. His entire immediate family lives in Lansing now. His parents run the International Food Mart on South Cedar Street, selling international food, drinks and gifts. Although Binod was attending the equivalent of college when he left Nepal, he was placed in the ninth grade at Everett High School. “I thought I knew a lot of English when I came here, but I didn’t,” he said, smiling. 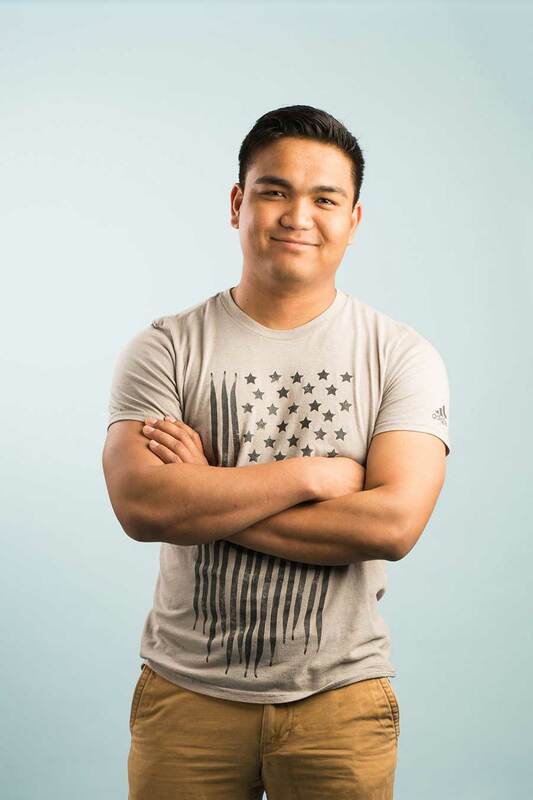 Binod credits his teachers and mentors at Everett for helping him graduate with a 4.0 GPA. 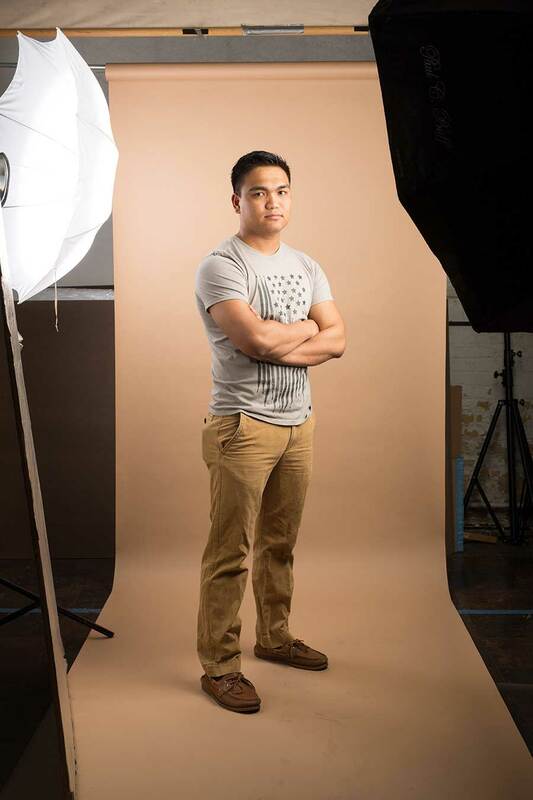 Binod Magar and his parents joined his six brothers and sisters in Lansing when he was 18. 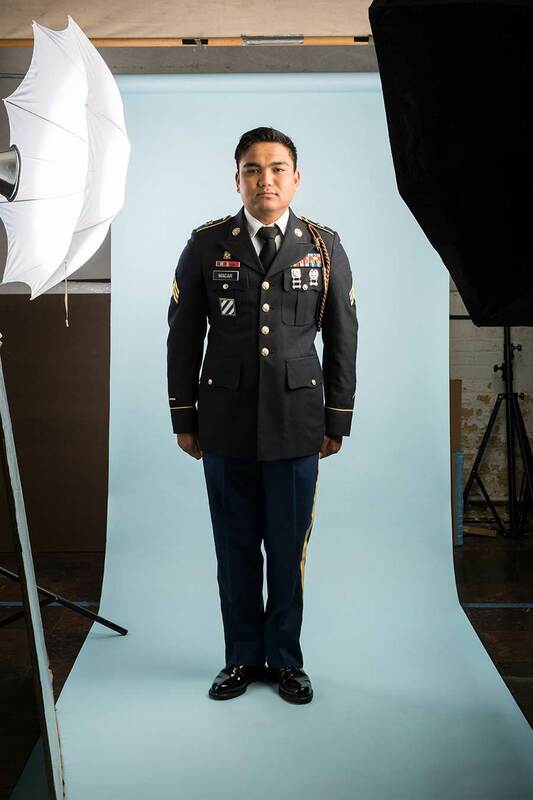 He graduated from Everett High School with a 4.0 GPA, joined the Army and served in Afghanistan. Binod is humble and quiet and often reluctant to talk about himself as a refugee. Sitting in the office of his family’s store, Binod shared a story about hiking in the Great Smoky Mountains when he was stationed in Georgia. He met another hiker who admired his Army-issue backpack, and they walked together for a few hours. The man told Binod refugees were terrorists and caused problems in their communities. That conversation — and a few others he wishes he’d had with friends who are no longer in his life because of their views — convinced him it’s important to talk about being a refugee. 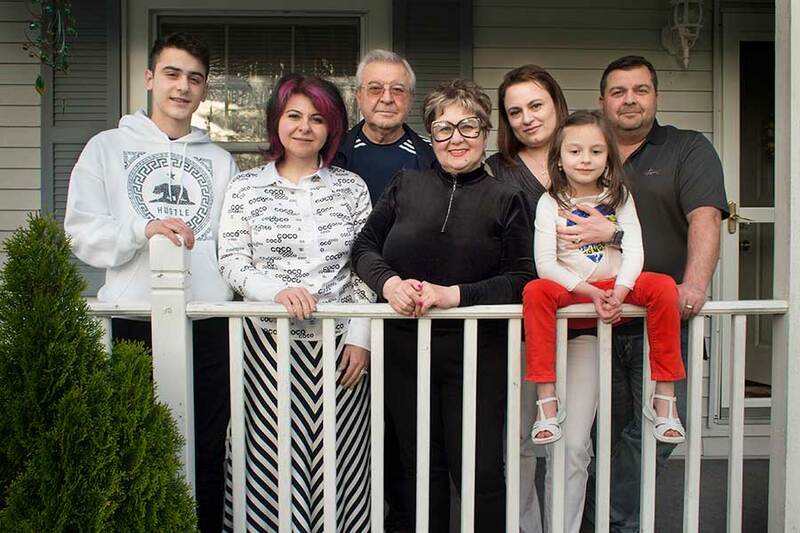 Fleeing the persecution of Armenians in Azerbaijan, Erica (Araksina) Titova, then just 16 years old, came to Lansing in 1990 with her father, Eugene Titov; mother, Tatyana Titova; her paternal grandmother, Asya Titova; and younger brother, Paul Titov. 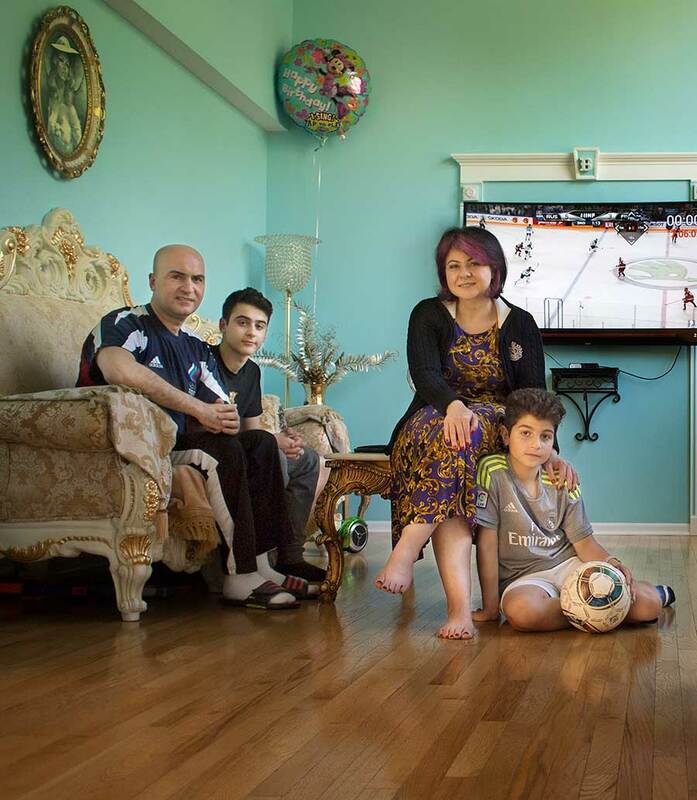 Erica still lives in the area today, with her husband, Igor Babayan, and her two sons Armen, 16, and Andranik, 11. The boys enjoy hockey and soccer. The Somali customer smiles at the greeting from Paul Titov, 39, co-owner of American International Bulk Food on Lansing’s south side. Despite the rain pouring down on this day, customers flow through the store steadily with a mix of languages being heard from aisle to aisle. Paul, whose family has owned the store since 1997, switches rapidly between Russian and English as he assists another customer, then speaks to his father, Eugene, and then asks a question of the butcher preparing orders at the meat counter. For Paul and his family, the store’s success is a realization of their hopes and dreams when they fled to America — and mid-Michigan — in the early 1990s. “The opportunities and safety that this country afforded us were not options for us in Azerbaijan at that time,” Paul said. That’s because Paul and his fellow Armenians were the target of violent resentment arising from political unrest and conflict in their region of Azerbaijan. This turmoil culminated in January 1990 with a week-long attack against Armenian residents in the city of Baku that included beatings, torture, murders and expulsions. The Titovs had fled to Russia prior to this and stayed with relatives. When they learned of an initiative allowing Armenians to apply for refugee status to America, the Titovs began the process. But their refugee status was confirmed. Originally told they would be going to San Francisco, the Titovs learned a month before the trip in December 1990 that the Lansing area would be their destination. Eugene Titov, his son Paul, and the rest of the Titov family has lived and worked in the Lansing area for 27 years. They own and operate American International Bulk Food on South Pennsylvania Avenue. The adjustment to American life was not easy at the start. Eugene began working as a janitor at Jacobson’s, a now-defunct department store. Tatyana worked at Sears as a salesperson for five years and volunteered at St. Vincent Catholic Charities as a translator for refugees, before being hired as an English tutor at Lansing Community College. Even Paul’s sister Erica (whose Russian name is Araksina), worked part-time at Sparrow Hospital while attending high school. She was 16 when they arrived. To help them learn English faster, Eugene required it to be spoken in the home at all times. These days, Paul and Erica have flipped that script and require their children to speak Russian so they can maintain a connection to their Armenian past. Paul and his wife, Asya Vardanova, have a 7-year-old daughter, Valerie. 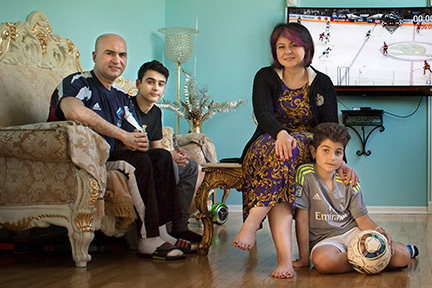 Erica and her husband, Igor Babayan, have two sons: Armen, 16, and Andronik, 11. 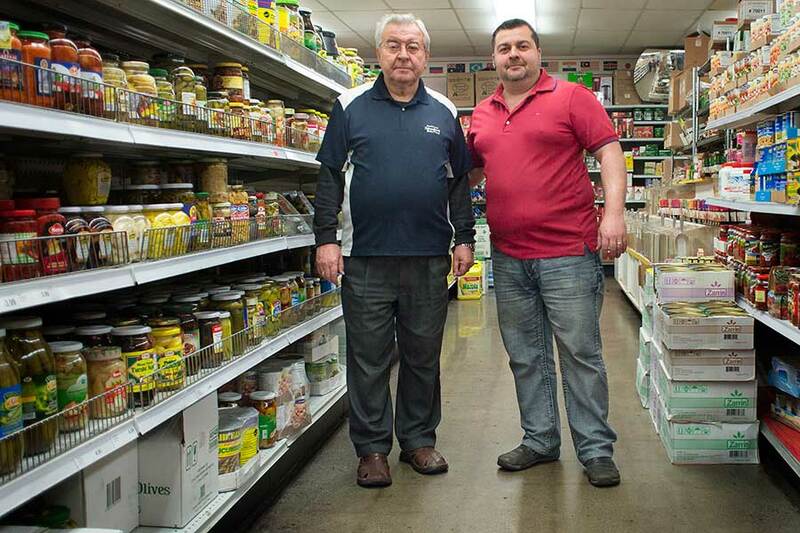 The Titovs have worked together to build up their business since buying it in 1997. Back then, it was called American Bulk Food. As their inventory expanded from bulk spices, rices and grains to include foods from more ethnic groups, they added "International" to the name and moved to their current location at 6016 S. Pennsylvania Ave.
Paul works closely with Lansing-area refugee services and immigrant groups to find out which groups are moving into the community so he can serve their needs. He says while Middle Eastern and Eastern European customers have remained a strong element of their customer base, they’ve also seen the numbers of Syrians, Sudanese, Somalis and other groups grow in recent years. Generations on the front porch of the family home in Lansing: at center, Eugene Titov and his wife Tatyana Titova ; at left, daughter Erica Titova and her son Armen Babayan, 16; at right, son Paul and his wife Asya Vardanova with their daughter Valerie, 7. 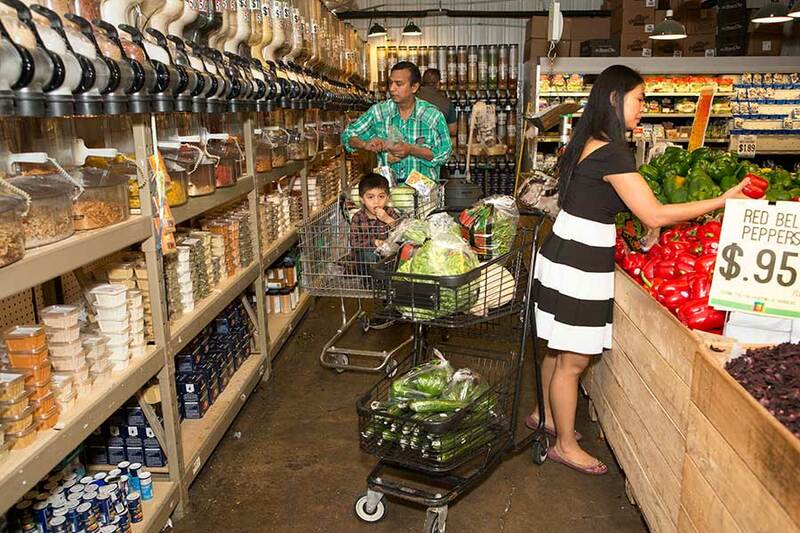 “I’m constantly researching what foods can be added to our inventory,“ he said. The store also honors the memory of Asya, Paul’s paternal grandmother, who died two years ago at the age of 103. She was a survivor who not only escaped the killings of Armenians in Baku, but also avoided being one of the 2 million Armenians slaughtered in Turkey as the Ottoman Empire ended. As reported in a 2015 article in the Lansing State Journal, published just days before her death, her family escaped into Georgia in 1920 when she was just 7 years old. By 1933, she had married into a wealthy family and moved to Moscow. Near the end of World War II, her husband and many of his relatives had been jailed by the Soviet government. Living on her own after giving birth to Eugene in 1944, Asya saved two Jewish families by hiding them in her basement while housing Nazi soldiers upstairs. That same brave spirit helped guide the Titovs as they journeyed to Lansing nearly 27 years ago. Even today, Paul marvels at the sacrifice his parents made. Originally from the war-torn Democratic Republic of the Congo, Khaliku Kaba became separated from his family while living as a refugee in Uganda. He was eventually resettled alone to Lansing when he was 21. The first thing you encounter when visiting Khaliku Kaba’s south Lansing home is a garden, well tended. The lush shrubs that create the real boundary to his yard make the fence line irrelevant. This yard and the house within were won at auction. Khaliku worked diligently to save for a home. When he discovered a house being auctioned off near where he was renting, he placed a bid never expecting to win. Inside, there is a cat named Lucy. “I named her after the mom in the movie ‘Home.’” She purrs and arches her back. The home smells of aromatic food. Khaliku has learned three languages in his travels. He says none of them come easily to his tongue. Khaliku was adopted as a child, but he didn’t know it. He discovered only after a family vacation to Uganda, when his adoptive parents told him after leaving that he had just met his birth parents. His adoptive parents lived in the Democratic Republic of the Congo, though they were Guinean. He had assumed the same of himself. Conflict between tribes forced Khaliku’s adoptive family off their land in the D.R.C., because they were not the “right” tribe. His father was beaten to death. With loss of life came loss of land. 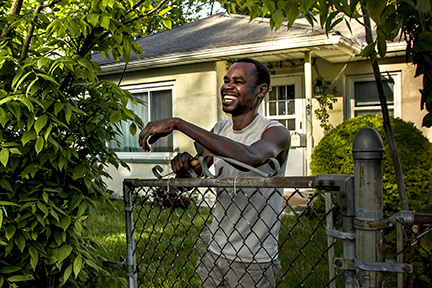 Khaliku has reconnected with family members who are still in Africa and bought a modest home in Lansing, with the hope that they will one day join him here. The entire family — Khaliku’s mom and his four siblings — were forced to walk toward Uganda. They spent months in limbo, sharing rest and food with other displaced families, unless no one had food or shelter. At times, there was no place to rest and no food to eat. The family eventually decided to use what little money they had left to rent a home in Kampala, Uganda. They did not want to go to a refugee camp if they could help it. Khaliku began working as a gardener in the countryside bordering the city. Every month he would send money home until, finally, he decided to return for a visit. When he got there, he found the home they had shared was empty. Thus began his persistent visits to the United Nations High Commissioner for Refugees to locate his family. Khaliku visited so often that he was noticed by a woman on staff and placed on a list to be resettled in the United States. As the only family member registered with the U.N., he was the head of the household. This made it possible for his family to travel with him. 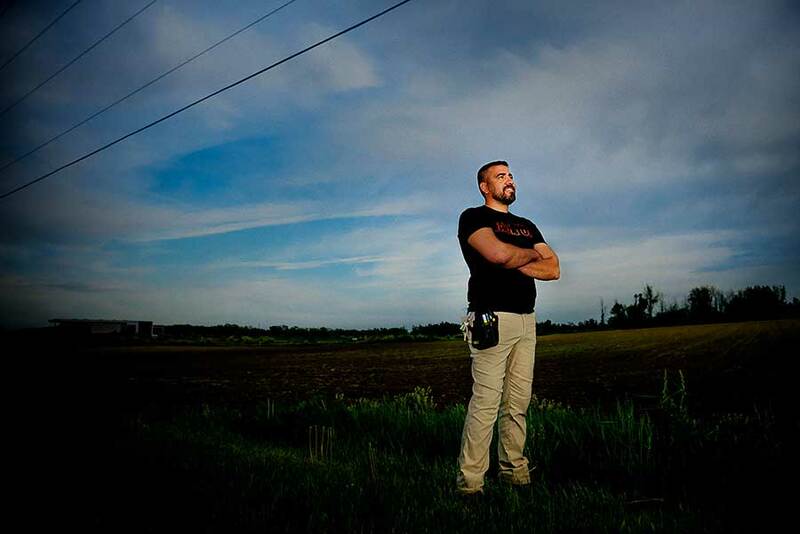 After more than a year of diligent searching, he decided to move to Lansing, Michigan, alone. Upon arrival, he labored and saved up for a home so that when his family arrived, they could live together. 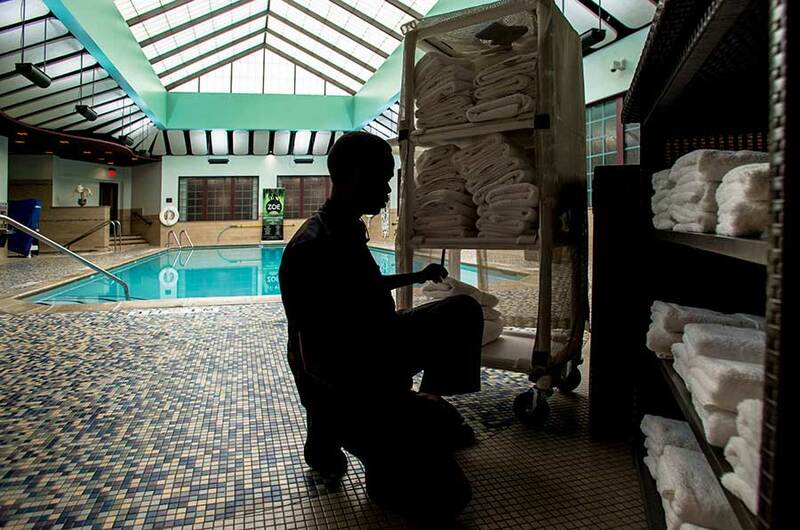 Khaliku has worked at the Crowne Plaza Hotel in Lansing since 2011. “I like working,” he said. Khaliku’s first job was at the Comfort Inn in Okemos. Since 2011, he has worked at the Crowne Plaza Hotel, saving enough to buy the modest, two-bedroom home he lives in today. After resettling in Lansing, Khaliku emailed the U.N. asking for help locating his family. They were finally reconnected at the end of 2010. Khaliku has been able to visit his siblings in Kampala, Uganda, but not his mother, who relocated to Sudan. He’s working to coordinate their relocation to Lansing. The current political climate makes that task more daunting and uncertain. He is still working, saving and tending to the place where he hopes his family will find an end to their displacement too. While meeting Khaliku’s cat or listening to the plans for his garden, you cannot see his father beaten to death. You cannot see his family’s land stolen or the forced wandering along the border of Uganda that followed. You cannot see the family lost and then found, but still not reunited. All you can see is what Khaliku asserts. Now that he has found his home, he will not be leaving again. Adopted, displaced, resettled, disconnected, transported and then finally, resettled. In Lansing, Khaliku is home. After facing persecution in Myanmar and fleeing to a refugee camp in Malaysia, Amawng Luai was resettled alone in Lansing when he was 17. Now 27, Amawng owns a business and has a family. From left: his son Daniel, 2; wife, Dawt; daughter, Judi, 3; and Alsang, 3 months. Gently pressing rice balls on to a rectangular sheet of pressed seaweed, Luai pats thin strips of vegetables and avocados into the center of a sushi roll. Using a plastic-wrapped wooden sushi mat, in seconds he rolls the sheet of seaweed with precision, the rice meeting neatly on both sides. Sushi rolls quickly accumulate. With a long-handled knife, he slices the rolls, three at a time, into bite-size spheres and then packages the uniform slices into lidded trays. For a final garnish, he separates the slices with a few ginger shavings and a dollop of wasabi. It’s this type of attention to each detail that has made the 27-year-old’s sushi sampler pack highly sought after. 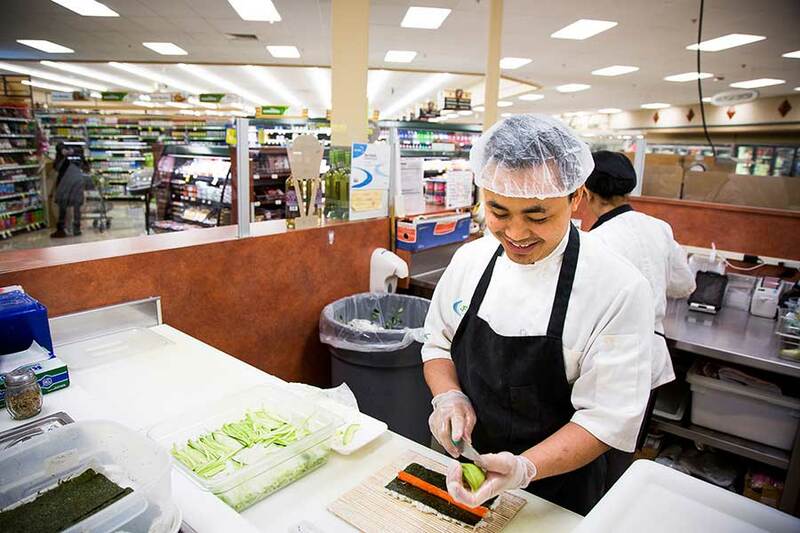 His business, AFC Sushi, makes everything fresh daily from a small booth in a Kroger store on Lansing’s west side. Sean, one of his regular customers, says it’s the best store-bought sushi in the area. But his regular customers are also quick to say that the service and attention he pays them are just as much a factor in his ongoing success as his culinary skill. Peering over a Plexiglass wall, he greets each person who stops by with a warm, friendly smile; they often smile in return. When he was in his early teens, violence, the threat of imprisonment and the desire for freedom drove Amawng and his brother, who were Chin refugees, to flee from Myanmar (formerly known as Burma) to a refugee camp in Malaysia. Though considered one of the four founding ethnic nationalities, the Chin people, who have occupied the hilly northwestern region of Myanmar bordering India for nearly 700 years, face opposition from the Buddhist majority government. Despite a population of roughly 1.6 million people, the Chin lack basic rights held by other citizens. “People flee for a better life and freedom. Freedom of religion, freedom of speech, equality,” Amawng said. Amawng owns a sushi business called AFC Sushi and helps interpret documents for refugees new to Lansing. Citizens were left without legal power to confront an authoritarian regime. In 1988, the Burmese government briefly ended its rule as a one-party nation. But the militia voided the newly elected governance in 1989 and Burma officially became Myanmar, with rule under a parliamentary government. Government agencies continue to document police corruption directed against the Chin and other ethnic groups in Myanmar that follow Muslim and Christian faiths. Restricted from travel within their own country, Amawng and his brother lived in fear for years. Police collected bribes and physically tormented or imprisoned those who attempted to find employment and educational opportunities or who failed to convert to Buddhism or violated other ethnically sanctioned rights. So they fled. Arriving with a group of 30 Chin refugees in New York City, Amawng, who was 17 at the time, arrived as an unaccompanied minor and was placed with a foster family. Amawng ended up in Lansing with his foster family; his brother was placed in Australia. As with most refugees, the language barrier was challenging for Amawng. Unable to communicate with his foster family, Amawng spent years in English classes at Eastern High School, vocational online language courses and attended Lansing Community College. After becoming proficient with his English skills, Amawng assisted refugees in processing homeowner documents, employment applications and reading their mail. It’s Amawng’s discipline, resourcefulness and optimism in the face of adversity that have driven him to success. Consider his sushi franchise. Sushi is not a dish native to Myanmar, Amawng’s homeland. Amawng developed an interest in the delicacy while working as a sushi chef for a friend in Lansing. Holding his newborn son, Amawng points to photographs displaying proud family moments in Lansing. Seeing sushi as a stepping stone to business success for himself, Amawng saved his paycheck for a plane ticket to California and enrolled in courses to learn how to operate his own business and purchase his own franchise. At the Kroger on Saginaw, Amawng’s franchise occupies a roughly 6-by-10-foot kitchen space. The booth is surrounded by baskets of crackers and buns and shelves of pickled ginger, wasabi paste and soy sauce. Not only is Amawng a business owner, he’s a job creator. As he prepared his rolls, one of his employees peeled and julienned cucumbers, avocados and carrots, which are placed in precise rows inside shoebox-sized plastic bins. 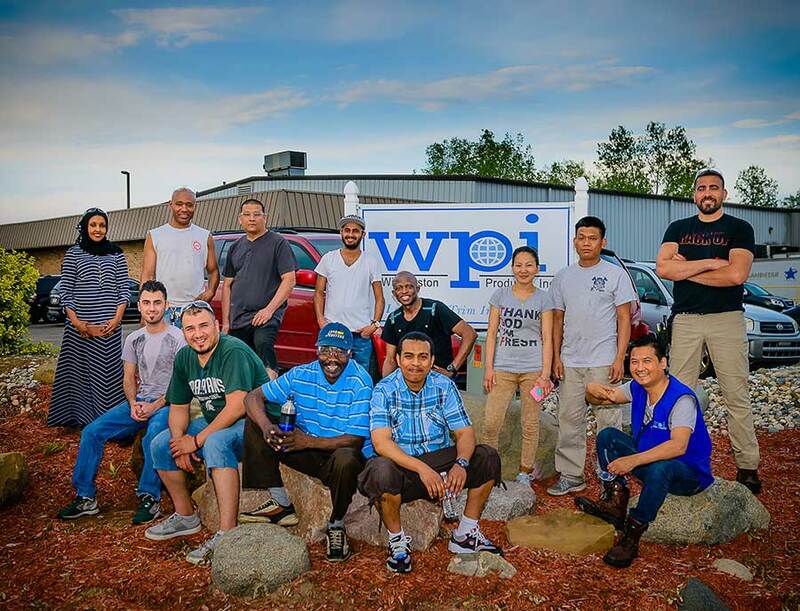 It’s one example of how refugees develop niche businesses that provide new jobs and opportunities for Lansing’s local economy. Amawng values the support he’s received over the years. He credits his success to his foster family and even Lansing’s infrastructure, citing the Capital Area Transportation Authority, the regional bus system, as playing a key role in helping him travel from work to school over the years. “The great thing about Lansing is the public transportation. You can go anywhere,” he said. Four years ago, he married his wife, Dawt, who was also born in Myanmar. He hopes to return to Myanmar soon to see his family, who he hasn’t seen in over a decade. He works extra hours at his second job, night shifts at a local manufacturing firm, to save what he can for the trip. As a result, he only gets to see his wife and three children for brief stints at a time. “I’m a busy guy,” Amawng said. Busy, but driven, by an unwavering hope to achieve a better future for himself and his family. 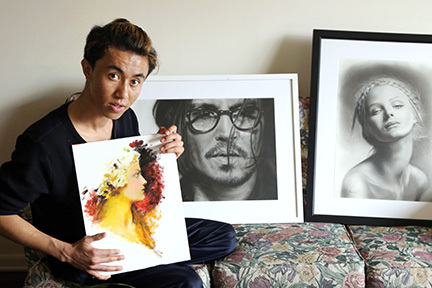 Persecuted as a member of the Hazara minority and threatened with torture by the Taliban for teaching drawing classes that were considered against Islam, Razmin Ahmadzada left Afghanistan when he was 17, eventually ending up in an Indonesian refugee camp. Now 19, he works at Meijer, is about to graduate high school, draws every day and dreams of working in the visual effects industry. Razmin Ahmadzada had a little workshop back in Afghanistan. 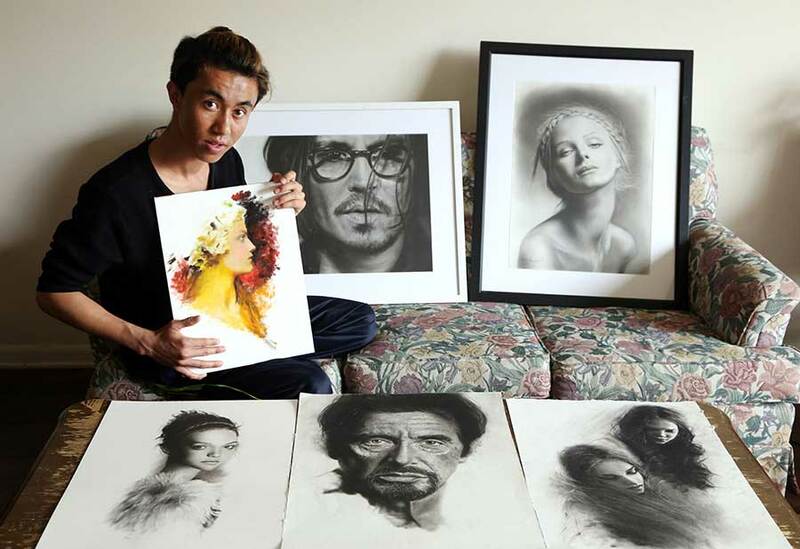 Though he was only 16 himself, he was teaching other kids how to draw and paint. And he sketched whatever inspired him: Animals. Scenery. Beautiful women. One day, a man came to see him at his shop. Raz didn’t ask who the man was. He knew: The man was Taliban. And Raz knew what “not acceptable” meant. They would make an example of him. “One day, they will kill me in front of people,” he thought. Raz knew people who had been killed by the Taliban, some in unspeakable ways. It was his uncle who helped him get to safety. He arranged for Raz to travel by car to Kabul and fly to India, then onward to Malaysia and Indonesia. It wasn’t the first time Raz had fled Afghanistan. He first left when he was 13, making his way to Pakistan and then Iran over a total of 12 treacherous days. He spent part of his journey on a harrowing truck ride and spent days hiking through the mountains. Paula Frantz, director of the Global Institute of Lansing, works with Raz on an English assignment. GIL, located in the basement of First Presbyterian Church in downtown Lansing, is a high school program for refugees who have aged out of Lansing public schools. Eventually, though, he was caught and sent back to Afghanistan. Years later, in Indonesia, Raz waited with thousands of other refugees. And waited. He smiles, now, remembering the day he got the news. He has lived in Lansing for nearly a year, after starting out with a foster family in Detroit. Raz goes to the Global Institute of Lansing almost every weekday, spending hours in a church basement working toward his high school diploma. The Global Institute helps refugees and immigrants who want to work toward a better life. Many, like Raz, arrive as older teens and would age out of high school before earning enough credits to graduate. The program makes it so they don’t have to settle for a GED, which would limit their prospects. 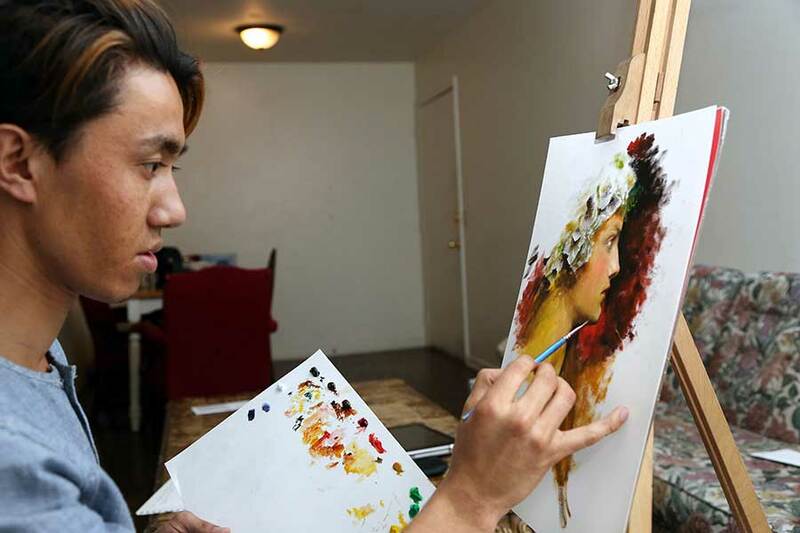 Raz draws or sketches every day in the sparse south Lansing apartment he shares with three other Afghan refugees. Instead, Raz will graduate soon and hopes to go to art school in California. His dream is to be a visual artist, maybe a filmmaker. In the meantime, his days are busy. He works at Meijer about 30 hours a week, riding a bike or taking a bus or getting a ride with friends. He studies and takes his turn cooking and cleaning the apartment. He follows his favorite artists online and often gets lost in his latest art project, painting for hours at a time. Sometimes he is able to connect with his four younger siblings back home via Facebook. His mother passed away while he was in limbo in Indonesia. She is the one who sparked his love of art, drawing horses for him on cardboard boxes when he was little. Raz knows he is lucky to live in a country where people are allowed to think — and speak — their own thoughts. Where everyone is free to practice any religion, or none at all. He is making the most of the opportunity. Raz seems stunned when asked about his back-up plan. What will he do if he doesn’t get into college?